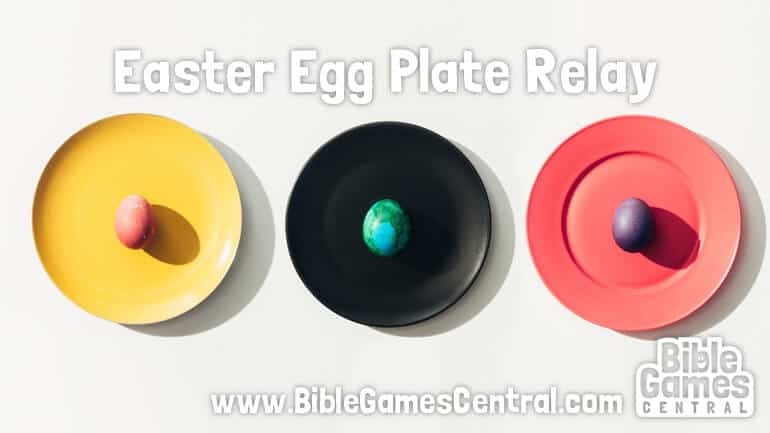 This Easter Game idea was shared by Bible Games Central. Use it to add a fun element to your kids teaching plan as we approach Easter Sunday. Use the discussion points below to make it a full lesson for children’s church too! Standing in a line, teams race to pass Easter eggs from one player to another using only paper plates. The first team to transfer all the eggs wins. This game can be used to introduce a lesson on Easter. The objective of this game is to transfer Easter eggs from one bucket to another. The eggs are passed from one teammate to another using paper plates. Place buckets containing Easter eggs at one end of the room. There should be one bucket for each team. Make sure there are equal numbers of Easter eggs in each bucket. Space out the buckets so that each team has enough space to stretch out their arms without knocking into each other. Divide the children into teams of 5 or more. Ideally each team has the same number of players. Have the first player from each team stand next to the bucket of Easter Eggs. He/she should stand such that the bucket of Easter Eggs is on his right. The next player stands roughly one arm-length away from the first player, facing the same direction as the first player, and so forth. Place one empty bucket next to the last player of each team. Give the first players of each team one paper plate to hold on his/her left hand. Give the last players one paper plate to hold on the right hand. Give all the other players two paper plates each, one for each hand. On “go”, the first players pick up one Easter egg with his/her right hand, puts it on his/her plate, and transfers the egg to the plate on the second player’s right hand. The second player transfers the egg to the plate on his left hand, then to the plate on the third player’s right hand, and so forth. The last player puts the egg into the empty bucket with his left hand. Only after the last player places the egg in the bucket can the first player start with the next egg. If the Easter egg drops at any time, it must be returned to the starting bucket. The first team to finish transferring all the eggs wins. After playing this game, use this section to guide you in your Easter lesson. 1. Did you enjoy the game? 2. Did your team drop any of the eggs? Was it easy to keep the eggs on the plates? 3. Do you know what Easter is all about? Although Easter eggs are not mentioned in the Bible, they are used by Christians around the world to symbolize the empty tomb of Jesus. Every year on Easter Sunday, we remember and celebrate the resurrection of Jesus. 4. What did the women expect to see inside the tomb? 5. Why was Jesus not inside the tomb? The women went to the tomb to anoint the body of Jesus with the spices they had prepared. But the body of Jesus was not in the tomb. The angel explained to them that Jesus had risen from the dead. Jesus is alive! Jesus is the Son of God. He came to earth to die on the cross to take the punishment for our sins. And on the third day, Jesus became alive again. Because Jesus died on the cross, our sins can be forgiven. We can be with God and have a relationship with him. We can become his children and will one day be with him in heaven.